What a stunning skirt!! Love the fedora!! i love your skirt! it's perfect with black! Perfect kind of outfit :) I like your shoes and sunnies very much! Oh I absolutely love your skirt! Love love love your skirt Krystal! Oh my gosh im dying over that skirt!! love the casual spin with the tee! This skirt is to die for!! SO GORGEOUS! I absolutely adore this outfit, it's so chic! I love the skirt, the print is amazing. Very nice combo with the super cute shoes, top & bag! You look stunning! That skirt is PERFECT for Miami! Also, both shoes are amazing, but I'm hoping you got the floral Tabitha Simmons. So cute! Such a fun and cute skirt! Perfect summer item. Such a perfect outfit for sunny Florida! You look adorable! I was going to ask you if you had come to Bal Harbour Shops!!! My favorite place to hang during weekends...LOL!!! Glad you had a good time! Isn't it awesome? I wish I had run into you! this skirt is gorgeous ! 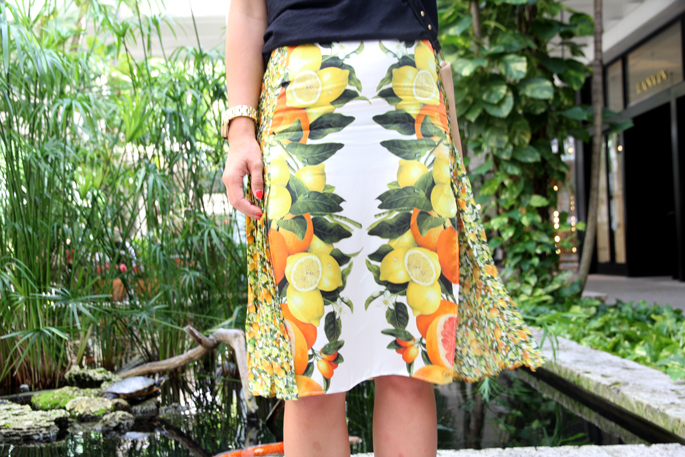 Your tropical skirt is adorable! Very fun! Your skirt is too fabulous! That skirt is so perfect for Miami! Really love this skirt, the print is so fun. The skirt reminds me a little of Versace. Krystal I love your blog. I met you in Berkeley one time with my friend Kelly Ly and you told me to start a blog. Well I did. :) Just wanted to say thank you for the advice. Your skirt is so darling. Love Bal Harbour, it's such a great space. This is the perfect outfit for Miami; tropical chic!